Henry Holt and Co., 9780805077926, 336pp. After John F. Kennedy’s assassination, Robert Kennedy—formerly Jack’s no-holds-barred political warrior—almost lost hope. He was haunted by his brother’s murder, and by the nation’s seeming inabilities to solve its problems of race, poverty, and the war in Vietnam. Bobby sensed the country’s pain, and when he announced that he was running for president, the country united behind his hopes. 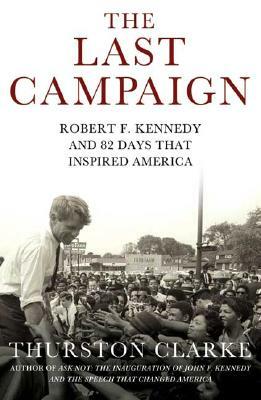 Over the action-packed eighty-two days of his campaign, Americans were inspired by Kennedy’s promise to lead them toward a better time. And after an assassin’s bullet stopped this last great stirring public figure of the 1960s, crowds lined up along the country’s railroad tracks to say goodbye to Bobby. With new research, interviews, and an intimate sense of Kennedy, Thurston Clarke provides an absorbing historical narrative that goes right to the heart of America’s deepest despairs—and most fiercely held dreams—and tells us more than we had understood before about this complicated man and the heightened personal, racial, political, and national dramas of his times. Thurston Clarke has written eleven widely acclaimed works of fiction and nonfiction, including three "New York Times" Notable Books. His "Pearl Harbor Ghosts" was the basis of a CBS documentary, and his bestselling "Lost Hero," a biography of Raoul Wallenberg, was made into an award-winning NBC miniseries. His articles have appeared in "Vanity Fair," "The New York Times," "The Washington Post" and many other publications. He is the recipient of a Guggenheim Fellowship and other awards and lives with his wife and three daughters in upstate New York.